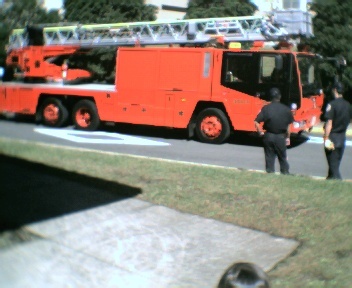 Although a bit unsharp, this photo shows a Japanese Ladder Truck according to the contributor. This is a Japan Fire Department TTL built on a Hino chassis and the ladder is made by Morita. Added by Jimmy on 12 July 2006. A Japanese Fire Turntable Ladder.Chassis is Hino but have been modified by Morita.TTL is built by Morita.This TTL is Morita 21st century innovation.Beside this Morita also mounted this TTL on Iveco chassis.Morita also has built a Special Ambulance(SA).Basically an ambulance the SA is equip with firefighting tools and a pump.The SA role is two, as an ambulance and as a light pumper. Added by Bomba Boy on 23 December 2006. Japanese toymaker Tomica/Tomy had produced scale model of this Hino TL and several othe Japanese fire trucks. Added by Bomba Boy on 03 February 2007. This Morita Ladder operates with an internal gyro to balance the ladder at any angle,the unit does not have a pump. Added by Dan Marshall on 27 June 2010.